I used to be a smoker. It was stupid, I know, but I did it for a very long time. I'm not alone, not unique, plenty of people made that same choice I did to take up the nasty habit when we were young and convinced we were invincible. Like tens of millions of Americans, I managed to quit and haven’t looked back. I would still be smoking today if not for the miracle (and it is indeed a miracle) of the e-cigarette. I vaped like a madman...and it was my bridge to a much healthier and happier lifestyle. To paraphrase one of the greatest modern cinematic scenes: Vaping is good. Vaping works. You’d think the scolds who lecture everyone about the dangers of smoking would be ecstatic about the dramatic drop in smoking rates in the United States thanks to this technology, but you’d be wrong. The government always wants more control over people, and more of our money, so anything new, popular and effective always ends up in its regulatory crosshairs. A few decades ago, government geniuses nearly shut down a nascent and thriving company called Microsoft, for crying out loud. There aren’t many people who, when they get exactly what they wanted for Christmas, complain about what they got for Christmas. That's what our busybody government regulators (often quietly or not-so-quietly fueled by competitors or sectors at risk from the societal benefits brought by the innovators) are like. The sad record shows that these people are more easily manipulated than babies, basically. For decades, the nanny state has been lecturing smokers about quitting. They went after private property rights of restaurant and bar owners, mandating that they eliminate the rights of adults to engage in a perfectly legal (even subsidized, which huge amounts of our tax dollars going to tobacco farmers) activity in their establishments. As if people went to bars for the health benefits. After having chased smokers out onto the streets, they’ve started chasing them out of anywhere in public, and even in their own homes in some cases. What they’ve never done is eliminate subsidies to tobacco farmers or simply declared cigarettes to be illegal. They won’t do that, there’s too much money in it for them. Cigarettes are more and more heavily taxed, which makes them a large and important revenue stream for all levels of government. Banning them means that money dries up. So, while talking about the evils of smoking, they’re benefiting from it, at this point likely more than the behemoth companies that make them. That’s why, even though these big government advocates are getting their way as smoking rates drop to their lowest levels in history, they have been complaining about what may be the most effective stop-smoking aid to come along ever. 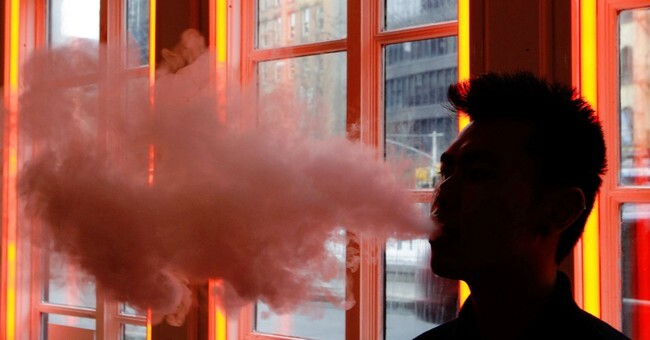 And, unlike the war on combustible tobacco products which has been nearly the exclusive purview of liberals, supposed free marketeers in and out of the Trump administration have joined the war on innovation by going after e-cigs. I quit smoking on my wedding day in 2015. That was it, I was done. But I didn’t go cold turkey. Anyone who’s ever smoked knows how hard that is. So, as I mentioned earlier, I started vaping. Vaping, for anyone living under a rock for the last couple of years, is a battery-powered device that allows people to inhale vapor mist with nicotine in it (though you can get it without nicotine, or even step down the levels of it incrementally) and doesn’t contain all the tar and other harmful chemicals traditional cigarettes have in them. It’s “healthy smoking,” if you will. It doesn’t smell, which is something you (not to mention those around you) become acutely aware of once you quit, and the exhale is water vapor. It’s a great tool for anyone looking to quit because, as former smokers know, what to do with your hands while you engage in the activities you did when you were a smoker is why a lot of people go back to the cancer sticks. Rather than embrace this incredibly helpful stop-smoking option, the same crowd who were hounding people to quit are, armed with some puzzling new allies, starting to treat vaping the exact same way they treated smoking. They’re banning it in places, trying to restrict sales (thereby restricting access), taxing it like crazy, condemning it as just as evil, etc. People who love government don’t actually like it when people quit smoking because it means less money from cigarette taxes. That’s why they’ve never considered making it illegal, they want their taste; they want to wet their beaks. They won’t take success lying down. And since it’s 2019, and everything is about race to the political left, they’re even whining about who is quitting smoking now. People are quitting, but the wrong people are quitting, laments the left and their media pets. This is the same left that wants to further restrict access to the e-cigarettes that are helping many Americans kick the habit. This is nuts. Smoking is down across the board, which is something that should be celebrated. They just can’t bring themselves to. They should be embracing anything that helps people break the habit, but they’re demonizing one of the newest and most effective tools to come along in generations, and are actively looking to prevent its use. Like Microsoft a few decades ago, the e-cigarette industry is closer than it probably realizes to being annihilated by the government and the left. Like Microsoft smartly did a few decades ago, they'd better fight like there's no tomorrow.